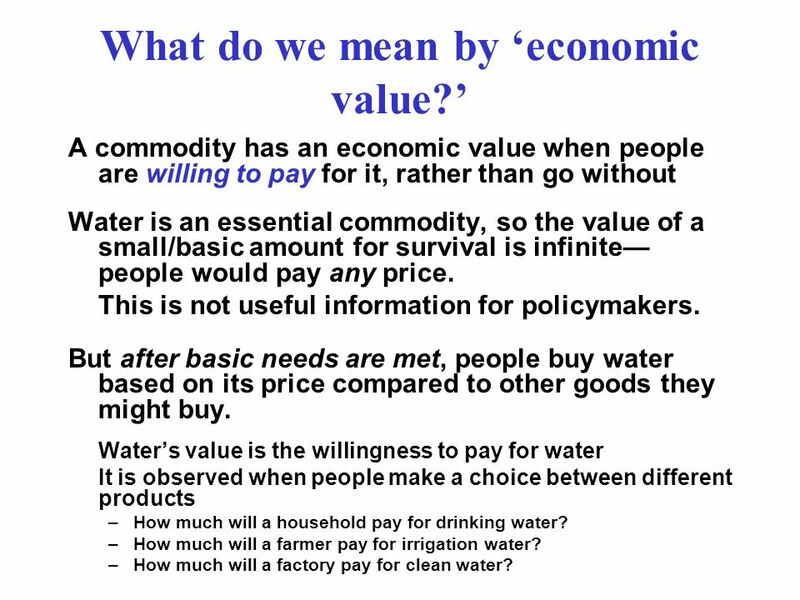 A commodity has an economic value when people are willing to pay for it, rather than go without Water is an essential commodity, so the value of a small/basic amount for survival is infinite—people would pay any price. 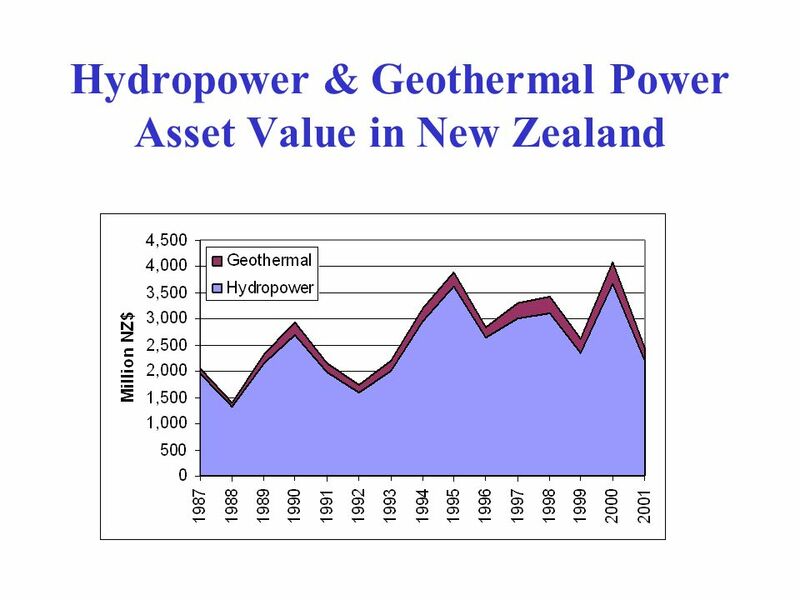 This is not useful information for policymakers. 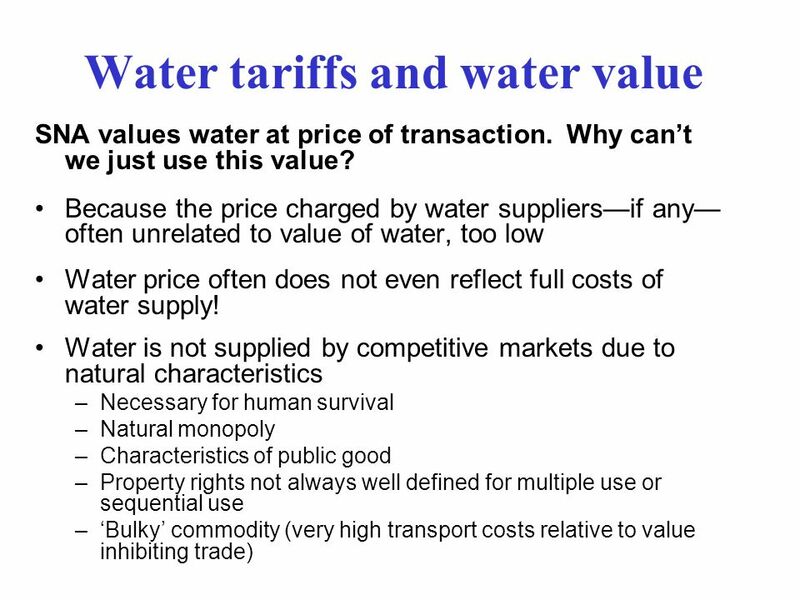 But after basic needs are met, people buy water based on its price compared to other goods they might buy. 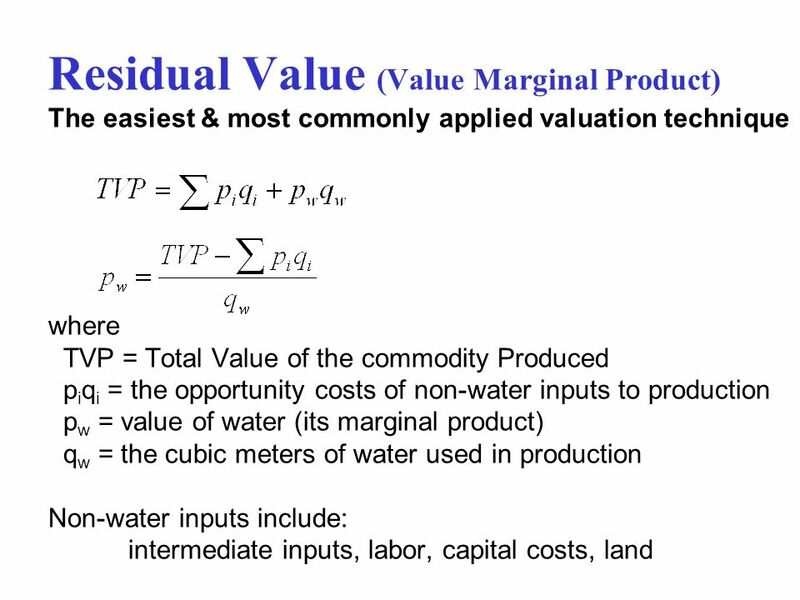 Water’s value is the willingness to pay for water It is observed when people make a choice between different products How much will a household pay for drinking water? 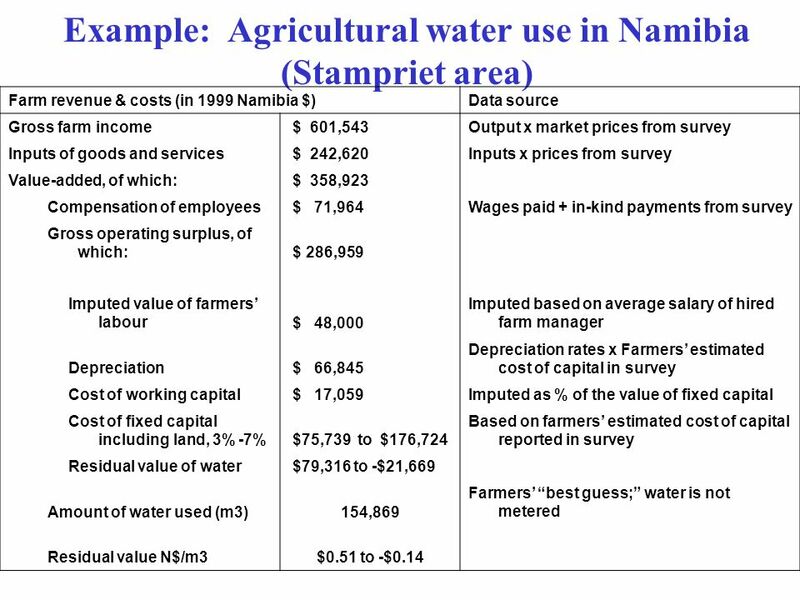 How much will a farmer pay for irrigation water? How much will a factory pay for clean water? 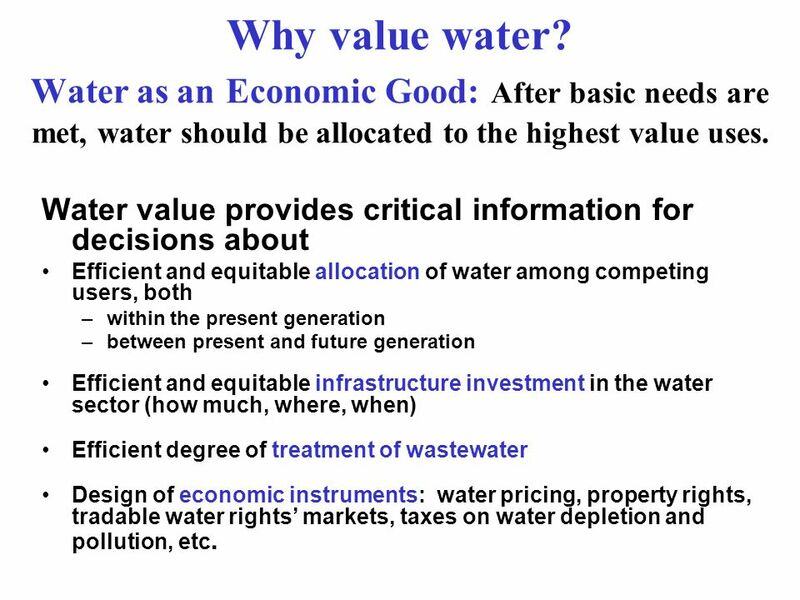 4 Why value water? 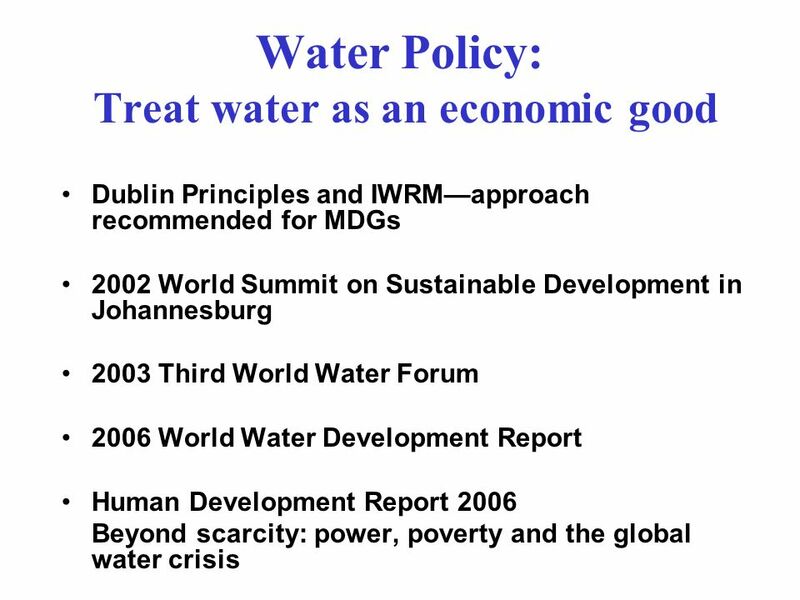 Water as an Economic Good: After basic needs are met, water should be allocated to the highest value uses. 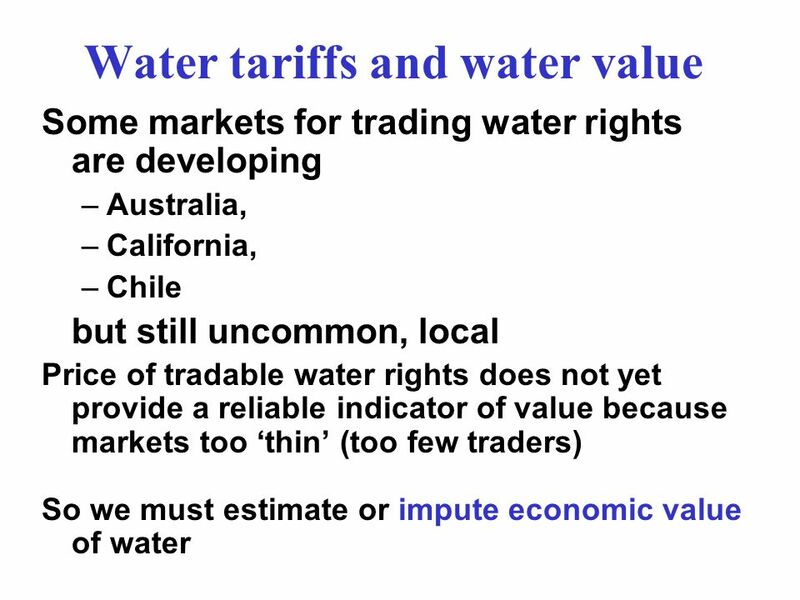 Water value provides critical information for decisions about Efficient and equitable allocation of water among competing users, both within the present generation between present and future generation Efficient and equitable infrastructure investment in the water sector (how much, where, when) Efficient degree of treatment of wastewater Design of economic instruments: water pricing, property rights, tradable water rights’ markets, taxes on water depletion and pollution, etc. 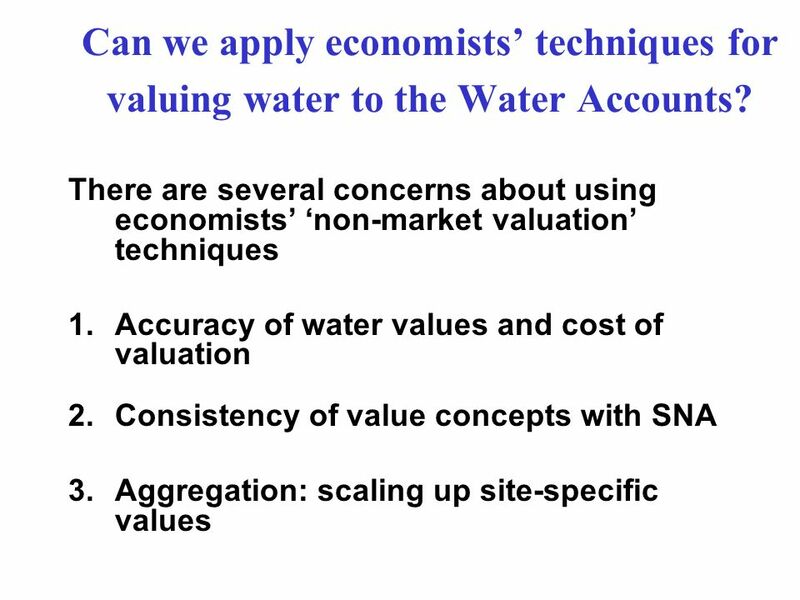 7 Can we apply economists’ techniques for valuing water to the Water Accounts? 9 2. 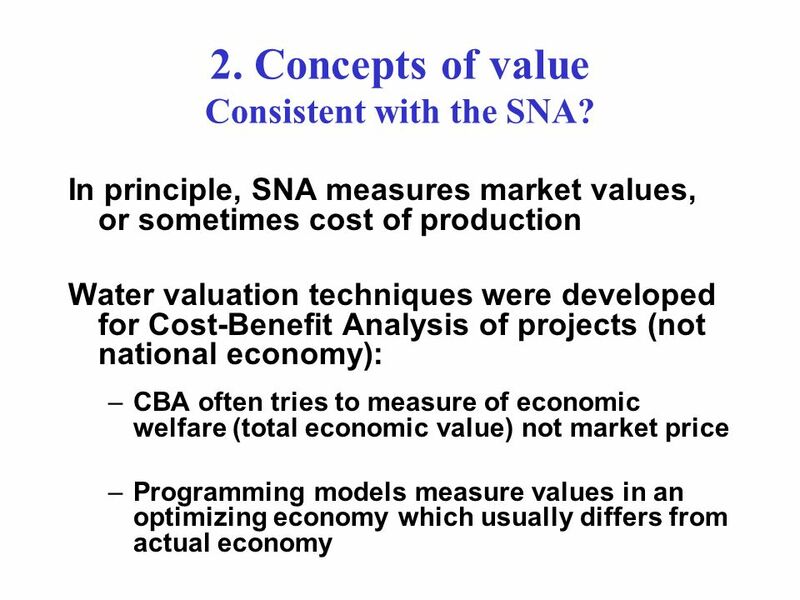 Concepts of value Consistent with the SNA? Is the quantity of water measured accurately? Is labor cost accurate—how to value unpaid family labor? 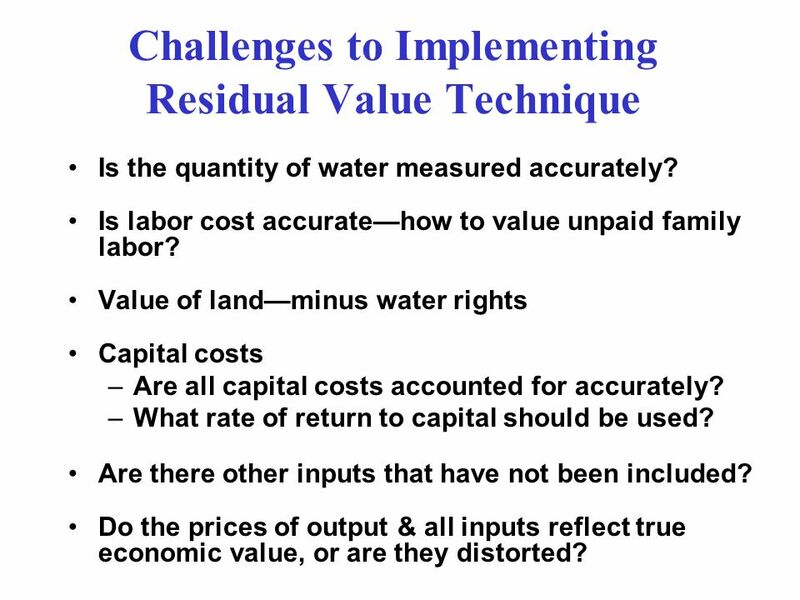 Value of land—minus water rights Capital costs Are all capital costs accounted for accurately? What rate of return to capital should be used? Are there other inputs that have not been included? 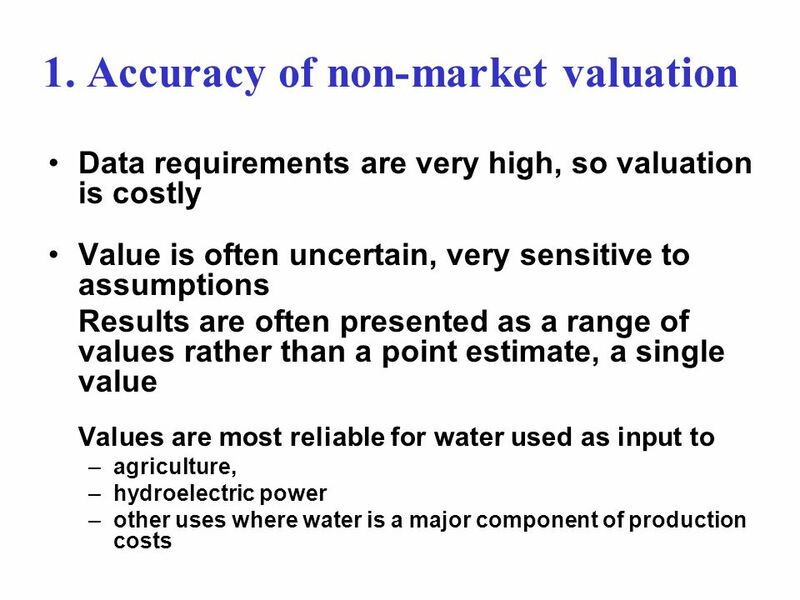 Do the prices of output & all inputs reflect true economic value, or are they distorted? 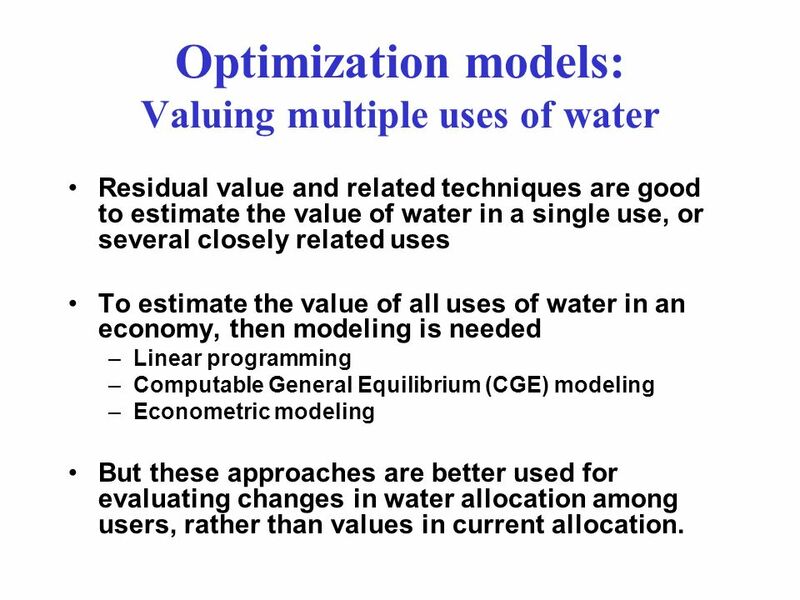 Residual value and related techniques are good to estimate the value of water in a single use, or several closely related uses To estimate the value of all uses of water in an economy, then modeling is needed Linear programming Computable General Equilibrium (CGE) modeling Econometric modeling But these approaches are better used for evaluating changes in water allocation among users, rather than values in current allocation. 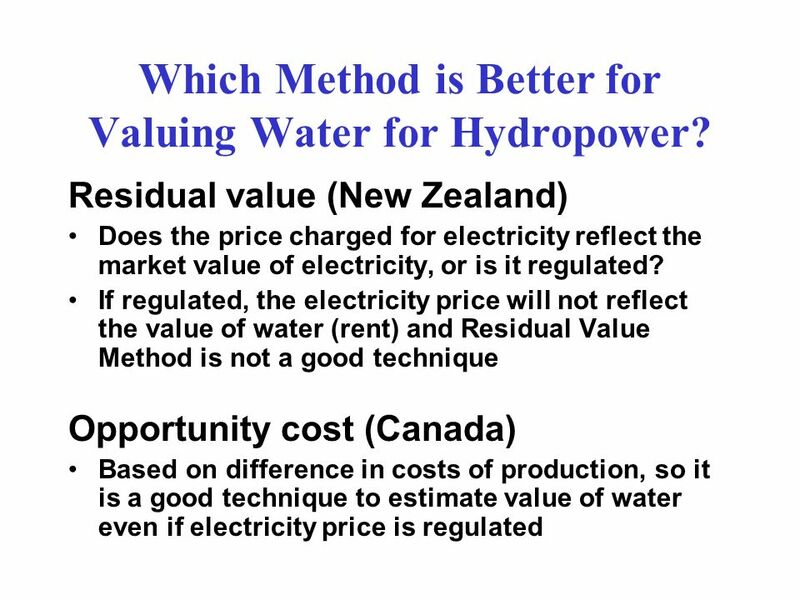 21 Which Method is Better for Valuing Water for Hydropower? 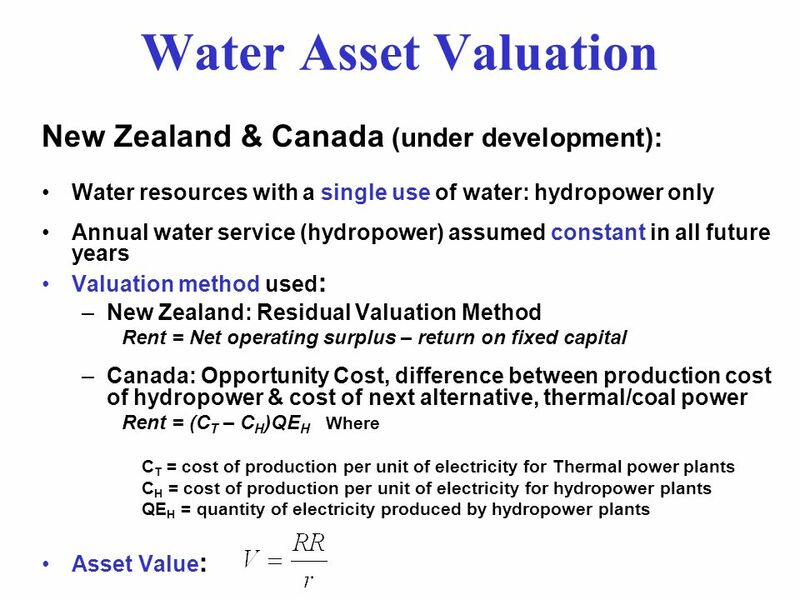 22 Can Water Asset Valuation be done in other countries? Yes, but…. 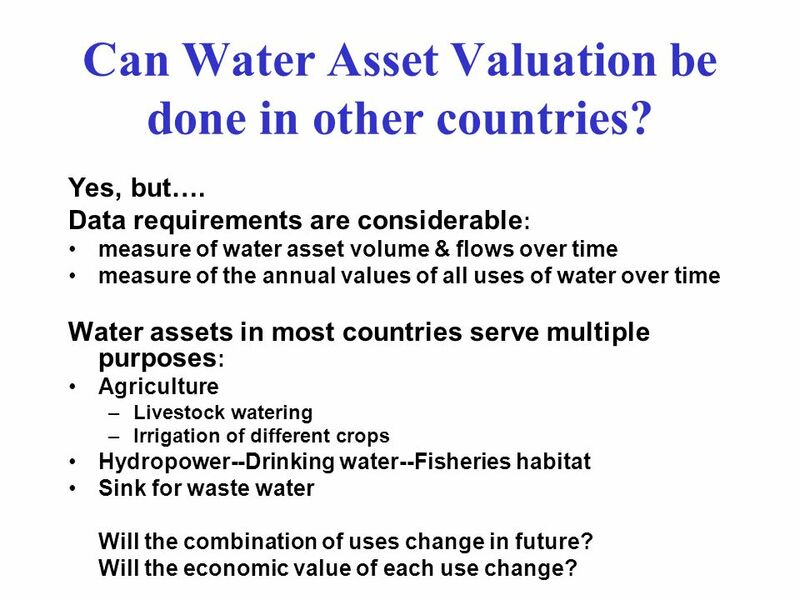 Data requirements are considerable: measure of water asset volume & flows over time measure of the annual values of all uses of water over time Water assets in most countries serve multiple purposes: Agriculture Livestock watering Irrigation of different crops Hydropower--Drinking water--Fisheries habitat Sink for waste water Will the combination of uses change in future? Will the economic value of each use change? 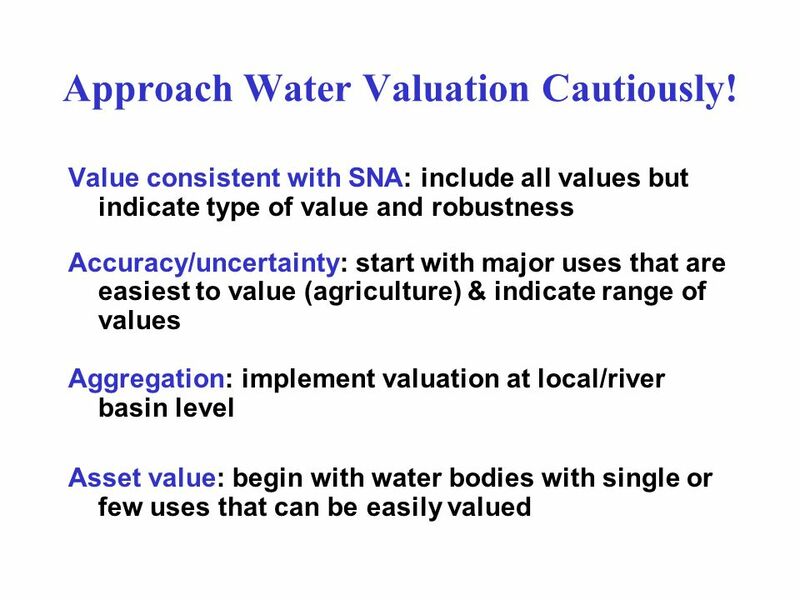 23 Approach Water Valuation Cautiously! 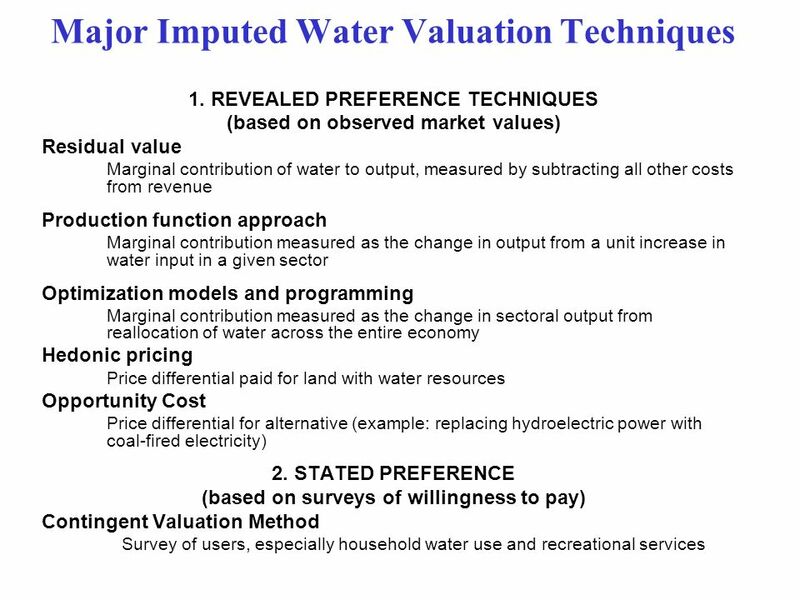 Download ppt "Valuation of Water Resources"
1 SEEAW – Asset Accounts and Valuation Regional Workshop on Water Accounting Santo Domingo, Dominican Republic July 2007 Michael Vardon United Nations. GDP by Income Approach and Accounts of Household Sector For Qatar Experience Prepared by : Aisha Al-Mansoori Statistical Researcher Population & Social. Statistical Issues in Measuring Poverty from Non-Survey Sources NATIONAL ACCOUNTS UNSD/NA/MR1 UN STATISTICS DIVISION Economic Statistics Branch National. Correcting Market Distortions: Shadow Prices, Shadow Wages and Discount Rates Chapter 6. Chapter 7 The Cost of Production. 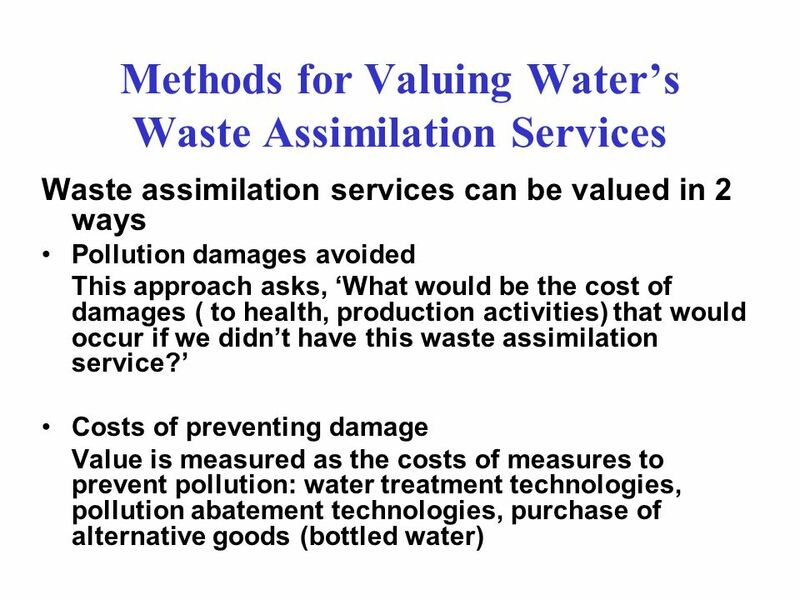 Chapter 7Slide 2 Topics to be Discussed Measuring Cost: Which Costs Matter? Cost in the Short Run Cost in the Long Run. 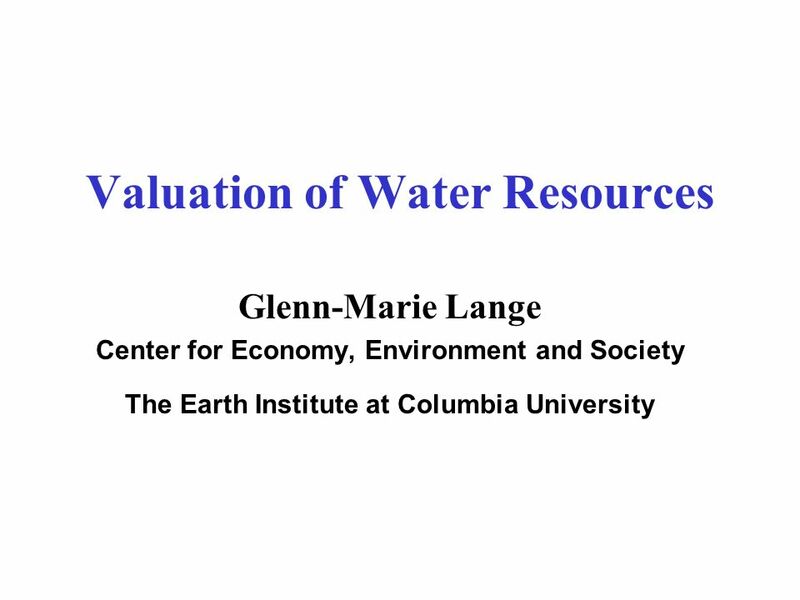 Valuing the Environment What exactly do economists mean when they talk about “valuing the environment” in monetary terms? CONCEPTS of VALUE. 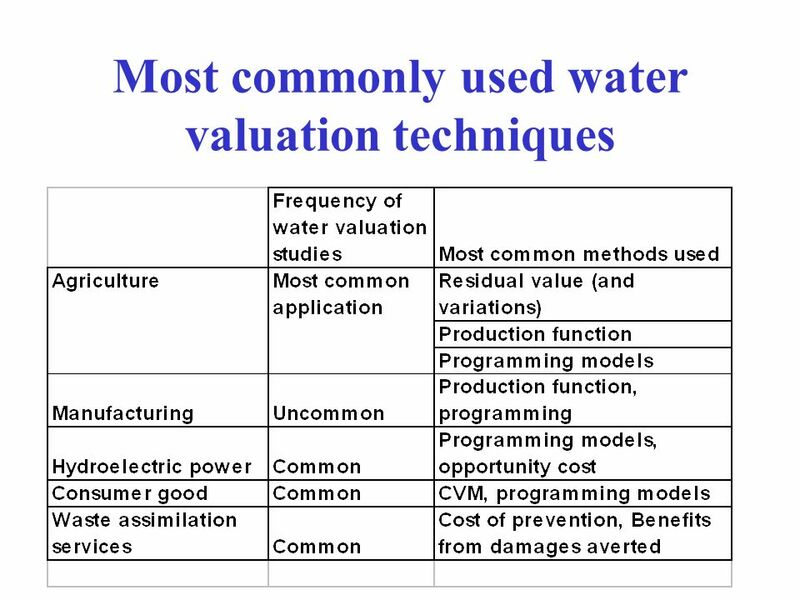 FACTORS OF VALUE UTILITY –THE ABILITY OF A PRODUCT TO SATISFY HUMAN WANTS. RELATES TO THE DAMAND SIDE OF THE MARKET. SCARCITY –THE. International Workshop on Hydro-Economic Modeling and Tools for Implementation of the European Water Framework Directive Valencia, Spain, 30 – 31 January. 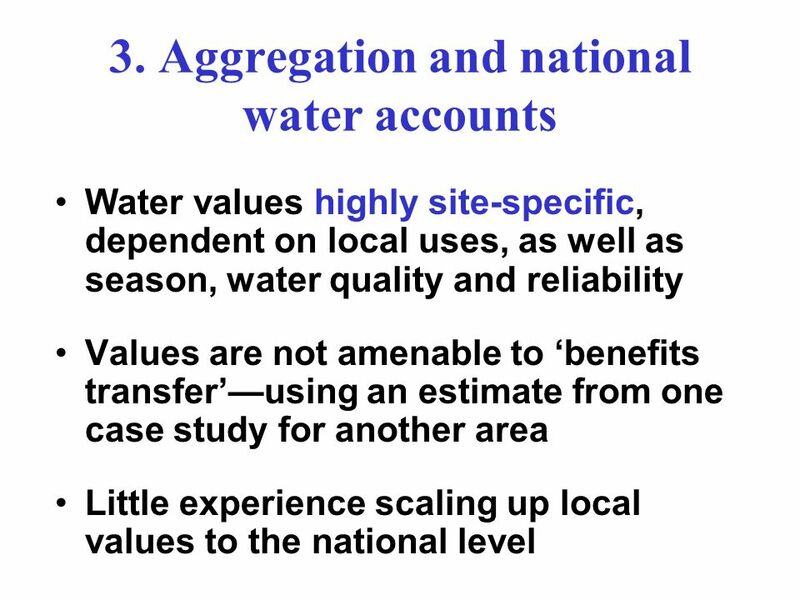 The Economics of Water for Environmental Flows Mitchell Mathis Houston Advanced Research Center Presentation for the Science Advisory Committee to the. Farm Management Chapter 20 Land  Control and Use. 21 GDP and the Standard of Living CHAPTER. 21 GDP and the Standard of Living CHAPTER. 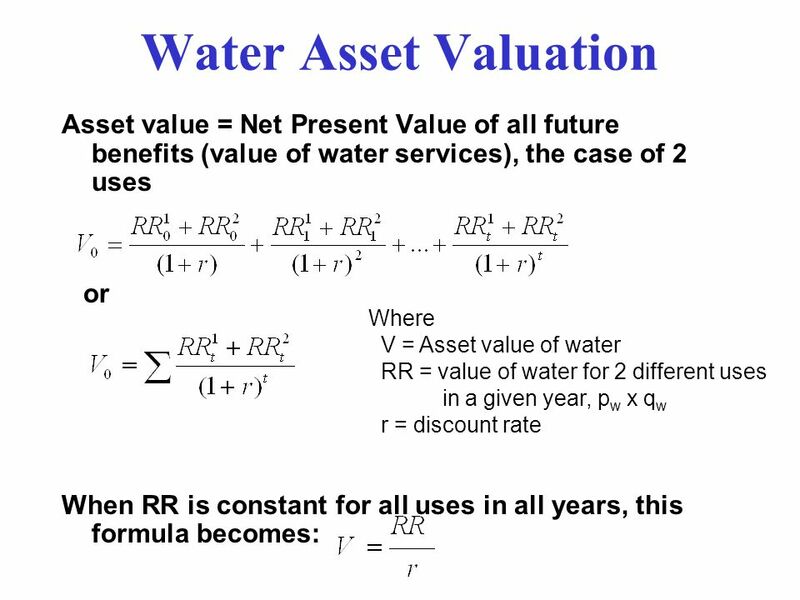 Econ 231: Natural Resources and Environmental Economics SCHOOL OF APPLIED ECONOMICS.